S I G N & D I G I T A L G R A P H I C S • March 2019 • 89 that adhere well to polycarbonate. "Some people struggle, especially with digital presses, when printing on some other plastics without some type of precoat," Millhof says. "A precoat gen- erally isn't required with polycarbonates for most digital and screen printing inks. 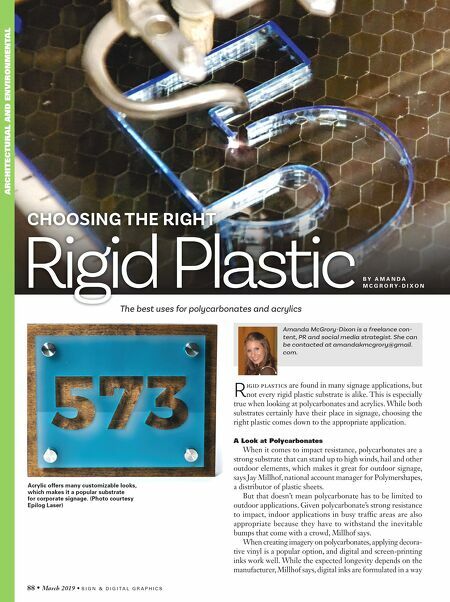 It's the nature of the resin, which is more receptive to ink than other plastics." If a sign shop needs to cut polycar- bonate, it should be aware of the edges, Millhof says. Although polycarbonate is a strong substrate, if any notches are left on the edges after cutting, it could even- tually crack, but using the right tools can prevent that from happening. "I would go back and make sure you're cutting with the right equipment and blade to avoid any notches," Millhof says. 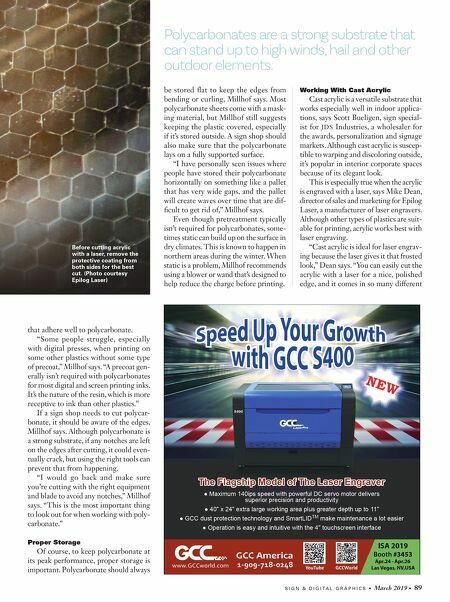 "This is the most important thing to look out for when working with poly- carbonate." Proper Storage Of course, to keep polycarbonate at its peak performance, proper storage is important. Polycarbonate should always be stored flat to keep the edges from bending or curling, Millhof says. Most polycarbonate sheets come with a mask- ing material, but Millhof still suggests keeping the plastic covered, especially if it's stored outside. A sign shop should also make sure that the polycarbonate lays on a fully supported surface. "I have personally seen issues where people have stored their polycarbonate horizontally on something like a pallet that has very wide gaps, and the pallet will create waves over time that are dif- ficult to get rid of," Millhof says. Even though pretreatment typically isn't required for polycarbonates, some- times static can build up on the surface in dry climates. This is known to happen in northern areas during the winter. When static is a problem, Millhof recommends using a blower or wand that's designed to help reduce the charge before printing. Working With Cast Acrylic Cast acrylic is a versatile substrate that works especially well in indoor applica- tions, says Scott Bueligen, sign special- ist for JDS Industries, a wholesaler for the awards, personalization and signage markets. Although cast acrylic is suscep- tible to warping and discoloring outside, it's popular in interior corporate spaces because of its elegant look. This is especially true when the acrylic is engraved with a laser, says Mike Dean, director of sales and marketing for Epilog Laser, a manufacturer of laser engravers. Although other types of plastics are suit- able for printing, acrylic works best with laser engraving. "Cast acrylic is ideal for laser engrav- ing because the laser gives it that frosted look," Dean says. "You can easily cut the acrylic with a laser for a nice, polished edge, and it comes in so many different Before cutting acrylic with a laser, remove the protective coating from both sides for the best cut. (Photo courtesy Epilog Laser) Polycarbonates are a strong substrate that can stand up to high winds, hail and other outdoor elements.